Have you ever heard of tigernuts? I discovered this health food through a post by Lauren of Empowered Sustenance. I was intrigued by their allergy-free nature, sweet taste and nutritional benefits. Don't be fooled by the name, they are actually not nuts, they are a type of vegetable, more specifically a tuber, that has been used by humans for thousands of years. 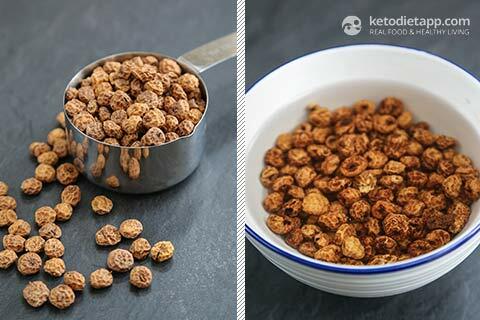 Tigernuts are perfect for making low-carb, dairy-free milk and you can use the dehydrated pulp as grain-free flour. Because tigernut milk is naturally sweet (more than almond milk), most of you won't need to use any sweeteners. It's simply delicious! Just like keto-friendly macadamia nuts, they are high in heart-healthy monounsaturated fats. They are a great source of resistant starch, a prebiotic fibre that resists digestion and feeds the good bacteria in our gut. Because they have an impact on digestion, you should introduce them gradually so that your digestion tract can adjust. You may want to start with quarter-half a cup before you get used to them. How about tigernut flour? There is a difference between regular store-bought tigernut flour and homemade tigernut meal/flour that is made from the leftover dehydrated pulp. 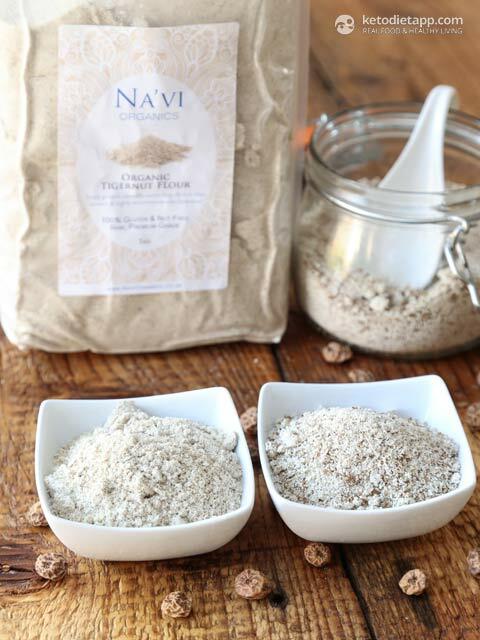 Homemade tigernut flour is made with leftover pulp when making low-carb milk. 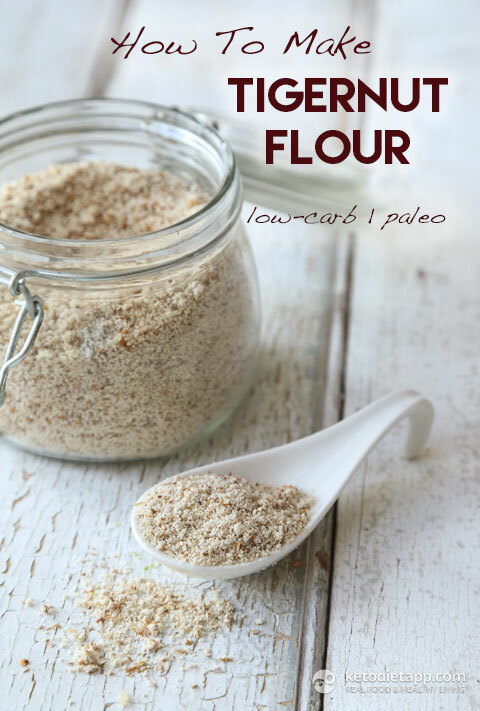 The flour contains less carbs (less than 1 g of net carbs per tablespoon). In fact, most of it is just fibre. The texture is light and airy. Store-bought tigernut flour is made from ground tigernuts and contains more carbs. The texture is fine and more dense. It's also distinctively sweeter compared to the homemade version where most of the carbs end up in the milk. A tablespoon of tigernut flour contains almost 3 grams of net carbs. 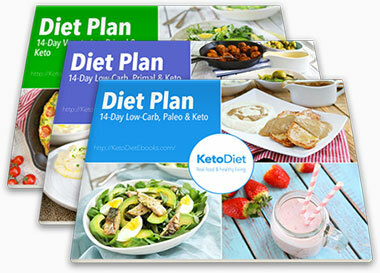 So, unless you use small quantities, I wouldn't recommend it for a very low-carb, ketogenic diet. I'm still new to tigernuts, so I'm planning to use tigernut flour in my recipes and see how it works. Note for KetoDiet App Users: This ingredient has been added to the KetoDiet food database and will appear in the upcoming update. Note: Nutrition facts are estimated based on available resources, including studies and several articles. 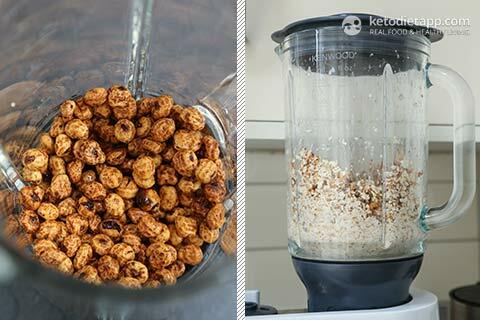 Place the tigernuts in water and let them soak for 24 hours. After 24 hours, drain and place in a blender (I used my Kenwood mixer with a blender attachment). Add a small amount of water, about 1/2 cup. Blend the mixture on high for 2-3 minutes. Add more water if the mixture is too dry and sticks to the sides. Then, pour in the remaining water and blend for another minute. Let it sit for 10-15 minutes. 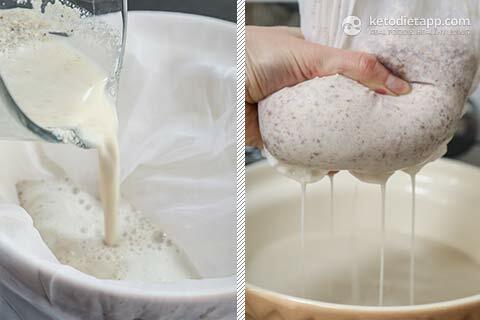 Pour the mixture through a nut milk bag or a fine mesh sieve lined with cheesecloth, into a bowl. Strain the mixture through the nut milk bag. Using your hands, squeeze out as much milk as possible (be careful, the mixture can still be hot inside). When done, optionally add any flavouring and pour in a container or a bottle. Refrigerate and use within 3 days. If you want to store it for longer, freeze in batches. Don't waste the tigernut pulp use it to make tigernut flour. Before you store it, you will have to dehydrate the tigernut pulp. Preheat the oven to 70-80 °C/ 160-175 °F. Spread the pulp over a large baking tray and place in the oven. Dehydrate for 4-6 hours or until dry. Mix a few times during the dehydration process. Otherwise, let it dry on a warm sunny spot in your kitchen and mix a few times. 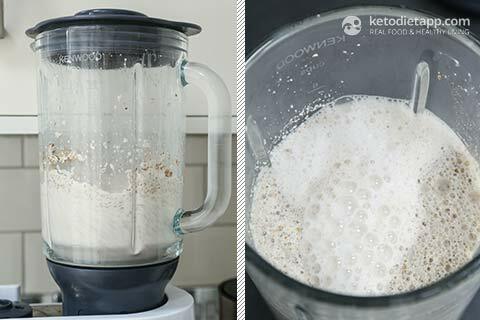 Once it's dry (not browned), place it in a food processor and pulse until powdered (I use this Kenwood mixer with a food processor attachment). Below is a comparison of store-bought tigernut flour (left) and homemade tigernut flour/meal (right). The homemade version is not as fine as store-bough tigernut flour but has has less carbs - most of it is just fibre. That's because store-bought tigernut flour is made with pure ground tigernuts while my homemade version is just the leftover from making tigernut milk. 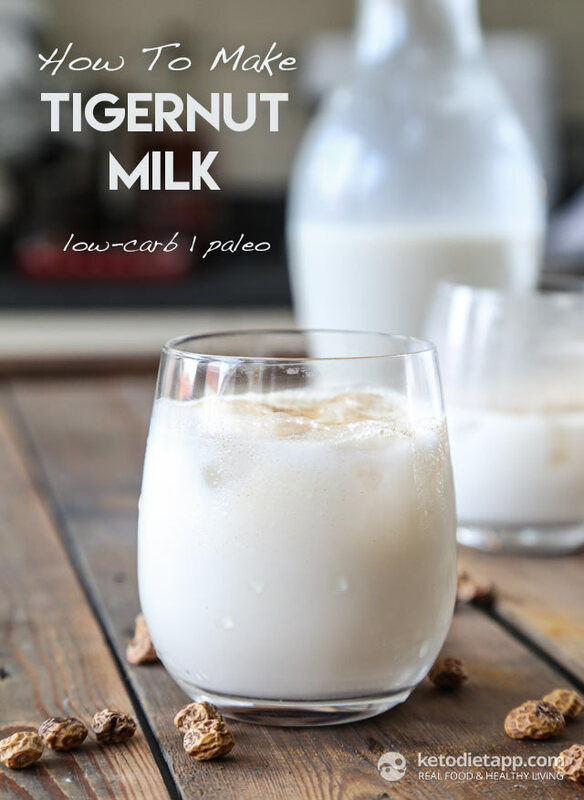 This week is my first time using Tigernut Milk and the taste is sweet and fabulous. The energy and cognitive mental process was so enhance, that I completed so many daily projects with speed and alertness. My wife said, why are you moving so fast? I was so happy to tell here, it is the Tigernut Milk. Hence, she replied, I will try it. By the way, she love it. I will try the flour next, I'm so excited. Thank you for sharing your instructions and recipes. Love it. . Thank you for sharing this Ray, I'm glad you like it! Thank you for posting something on tiger nut. I will try the milk. Please can I make use of the milk for my beverages? I tried this and it makes a great milk that needs no sweetener. However, I found that the flour from the pulp is rather gritty no matter how much you grind it. The products baked from it also have that same grittiness. Because of the beneficial fiber and nutritional content I will continue to add it to baked goods at a reduced rate of about 25%. Hi Jill, I agree, it's naturally sweet!  I think that the leftover pulp is quite gritty and is best used together with another ingredient, such as almond or coconut flour. can i just mix them without soaking them in advance? when I eat them as a snack, can i just eat them unpeeled or also just have to soak them during 12hours? Hi Celine, You can eat them whole without soaking (peeled or unpeeled). I haven't tried using the leftover pulp but I suppose you could use it just like almond flour. Keep in mind that you may need to add more liquid ingredients (it will be more absorbent compared to almond flour). Thank you so much for sharing these two recipes!! I love that one segues into the other. I have just recently discovered and fallen in love with tigernuts. I have Hashimotos and the autoimmune paleo diet benefits me. Tigernuts have satisfied that need for carbs without issues or side effects. I have a feeling this will be a staple in our family. Would you mind linking the brand you purchased? Some of them have really scary amazon reviews! Thanks! Hi I was wondering how long the flour will last? It should be similar to coconut flour, so if properly dehydrated, for about 6 months. I'm so glad someone did a post about Tiger Nuts. I almost bought some last year, but saw that they were pretty high in carbs. I noticed that they are slowly making their way into Paleo blogs. Can the be eaten out of hand? TigerNut flour has 19 grams of carbs, 10 grams of fiber & 2 grams of protein per 1/4 cup. There is a significant difference between tigernut flour (dehydrated leftover pulp when making tigernut milk) and tigernut meal (ground tigernuts). In fact, there is less than 3 grams of carbs per 1/4 cup of tigernut flour - as compared to 12 grams per 1/4 cup of tigernut meal. I hope this helps! Any idea where tigernuts can be achieved in the netherlands or germany. Sorry, I'm not sure where to buy them in Germany but you should be able to find them online. I got them from Amazon UK. This looks really interesting and I plan to try it. Did you use the peeled tiger nuts? I used whole tiger nuts but I think that you can use either. I don't think that you will need to soak peeled tigernuts for that long. Tiger nuts are what horchata was originally made from. They are the tuber of nut sedge grass. There is evidence they were eaten by paleo humans and they were cultivated at least as far back as ancient Egypt. This was one of my favourite nut growing up. when u chew on it the liquid extracted in ur mouth is actually like milk. naturally sweet too. I will be buying the nut to make milk.